All cancer is bad, but skin cancer is the most common of them all, affecting one in five Americans throughout their lifetimes. Melanoma, the deadliest form of skin cancer, claims a new victim every 52 minutes, even though it accounts for just 1% of global skin cancer cases. Beyond wearing sunscreen every day, the best thing you can possibly do is catch skin cancer early, and one group of scientists is trying to make that a lot easier by calling in the robots. That may sound scary, but the gist of it is pretty simple. After showing a computer program a massive library of clinical images of various skin cancer moles and lesions, Stanford scientists have taught a machine to correctly identify skin cancer as accurately as a dermatologist would. They did it by applying a "deep convolutional neural network" -- basically a packet of algorithms used in artificial intelligence -- to a dermatologist's regular diagnostic process. 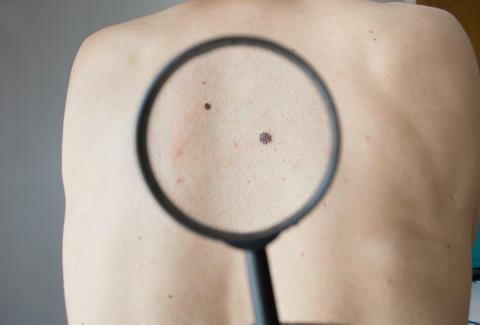 The first thing a trained dermatologist will do is look at a patient's moles or skin lesions and tell them whether the mole should be biopsied for skin cancer. In essence, these scientists "taught" their convolutional neural network how to do the same. After priming the algorithm over the course of a week with millions of images of ordinary items -- dogs, tables, chairs, etc. -- they then fed it a dataset of 129,450 clinical images of verified, biopsy-proven skin aberrations. These represented more than 2,000 different types of skin diseases and aberrations. All the while, the neural network took in that information and wrote -- "learned" -- rules around how to diagnose those skin aberrations. Then came a diagnostic test on both the deadlier melanoma and non-melanoma skin cancers. The researchers put their convolutional neural network up against 21 board-certified dermatologists and found its diagnoses to be just as accurate as theirs. Per the study: "The CNN achieves performance on par with all tested experts across both tasks, demonstrating an artificial intelligence capable of classifying skin cancer with a level of competence comparable to dermatologists." Which is kind of insane. The study points out that "this fast, scalable method is deployable on mobile devices." It could change the game of how skin cancer, and melanoma specifically, is treated. If you catch melanoma early, your five-year survival rate is 99%. If you catch it in its latest stage that number drops to 14%. We're not quite there yet, but imagine being able to diagnose it on your phone. "This is a very specific study, and it has a very encouraging result," said Thrun, but he admits that they'll need to test it for real in doctors offices before it can start the real work of saving lives. Still, this futuristic AI isn't the only way to protect your body from skin cancer. Even swarthy, sun-kissed Australian gentlemen like Hugh Jackman can get skin cancer. You should definitely see a dermatologist at least once a year and get checked. Additionally, here are a couple other methods approved by the Skin Cancer Foundation that can help you catch any problems early on your own. Asymmetry: Benign moles are usually not symmetrical. Border: Benign moles usually have a border around them. Color: Benign moles usually have a single color, not discoloration. Diameter: Benign moles usually have a smaller diameter than malignant ones. Evolving: Benign moles usually stay about the same and do not evolve or change much. If your mole fails any of these tests, get it checked by a dermatologist. The Ugly Duckling Sign: Is the mole an outlier? Developed to complement the ABCDEs in 1998, this basically asks whether a given mole is an outlier in a group. Basically, if a large or changing or discolored mole is surrounded by moles that look different, it might be malignant and should be removed and biopsied. That's how often dermatologists recommend you give yourself a thorough, head-to-toe once-over. The Skin Cancer Foundation has a good guide to giving your body a step-by-step examination. Stay safe out there, and by the way, your skin looks great today. Eric Vilas-Boas considers the buoyant spring in his step after a clean bill of skin health one of life's remaining great joys. Follow him @e_vb_.